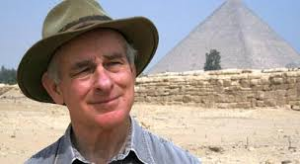 Mark Lehner is the author of what is considered by some to be the definitive book on the Egyptian Pyramids, although his earlier work has drawn a share of harsh criticism from the likes of Margaret Morris(b). However, his road to ‘conventional’ Egyptology began with a fascination with Edgar Cayce and his Atlantis psychic readings. In 1974 Lehner wrote of his support for Cayce’s ‘revelation’ of a connection between Atlantis and a pre-dynastic Egypt. He includes an attempt to explain away such wonders as humans with ‘animal appendages’ including legs with feathers and ‘electrical surgical knives’. It may be pertinent that in 1973 Lehner was enrolled at the American University in Cairo, thanks to a grant from the Edgar Cayce Foundation. Nevertheless, it appears that by 1977 he had begun his journey towards orthodoxy by renouncing his support for Cayce’s views on ancient Egypt. His recent book on the Pyramids studiously avoids any reference to either Cayce or Atlantis. An outline of his work, as an Egyptologist, by Evan Hadingham was published in the February 2010 edition of the Smithsonian magazine(a).